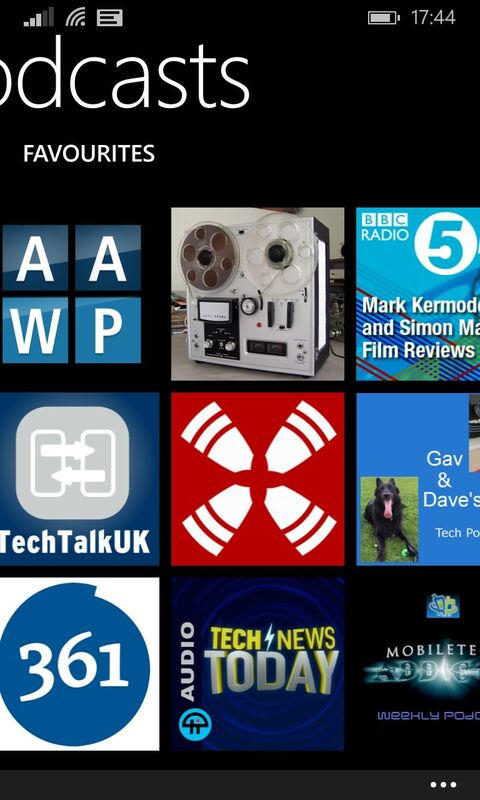 Coming along for the ride with Windows Phone 8.1 (out now in 'preview' mode) is a whole new application from Microsoft - Podcasts. Yes, you've guessed it, yet another podcatching application, except that this time it's from the people who make the OS and it's pretty darned slick. Unfortunately, it's also pretty darned limited, so podcast fans shouldn't uninstall their favourite third party podcatcher just yet. Part review, part feature, here's my assessment of this application that's arriving very soon. 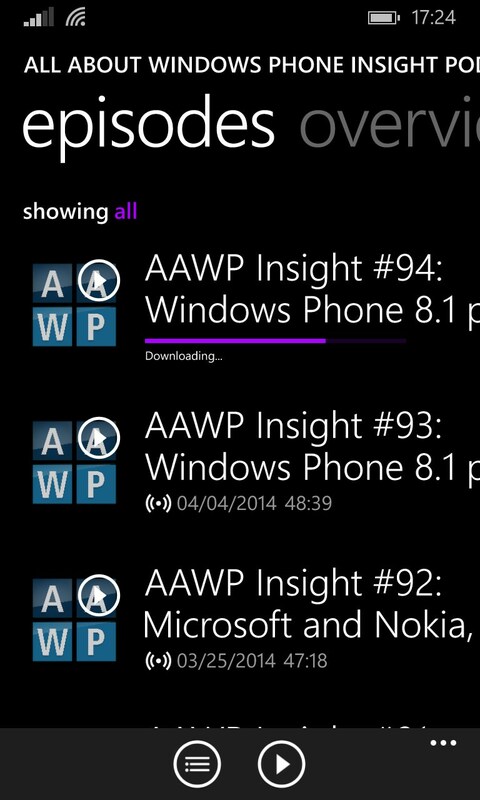 Yes, yes, Windows Phone 8.1 is only out for people playing with the preview for developers, but it'll come to everyone over the next few months, so it's well worth peeking ahead and looking at some of the highlights of the new release, in terms of how they relate to everyday use of the OS in the real world. In this case, gathering favourite podcasts. The minimalist splash screen - and no, it's nothing to do with Cortana! 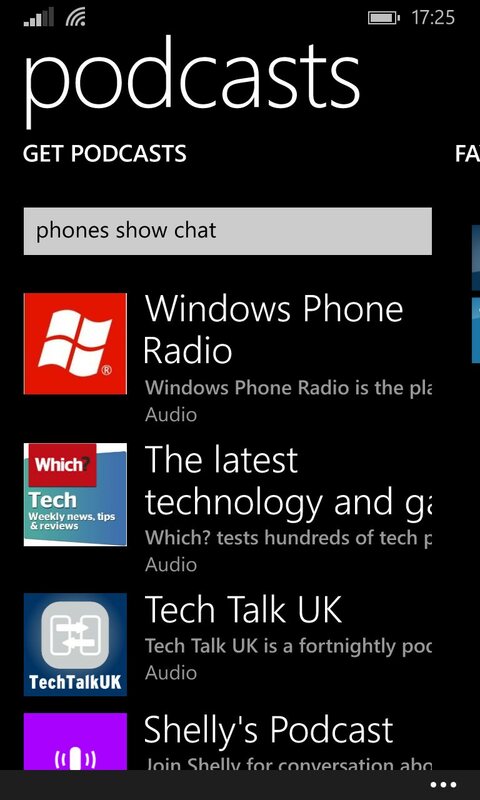 (right) Getting started - hey, All About Windows Phone is there! We'll come to that asterisk in a moment, don't worry. The very presence of a couple of 'no's in the table should indicate to you that this is something of a basic solution, but don't interpret that too negatively. After all, not everyone follows a set of thirty podcasts and needs to hear them within 24 hours of broadcast time - power user, me? Heck, yes. But Joe Normal, with a new Windows Phone, might only want to try out a handful of favourites that he'd heard about, he wouldn't be worried about management or download-vs-streaming, he just wants to find a popular podcast and press a big 'play' button. 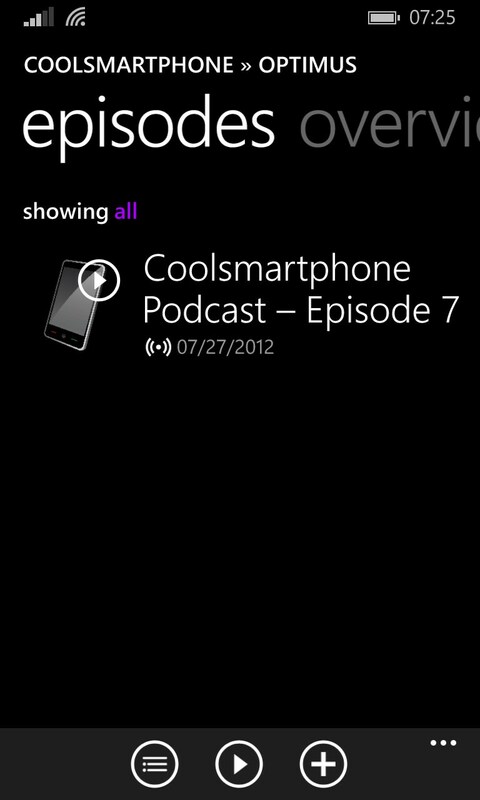 And, for such a use case, Microsoft's Podcasts is fine. In fact, the UI is exemplary, with the panorama view swiping between 'favourites' (i.e. 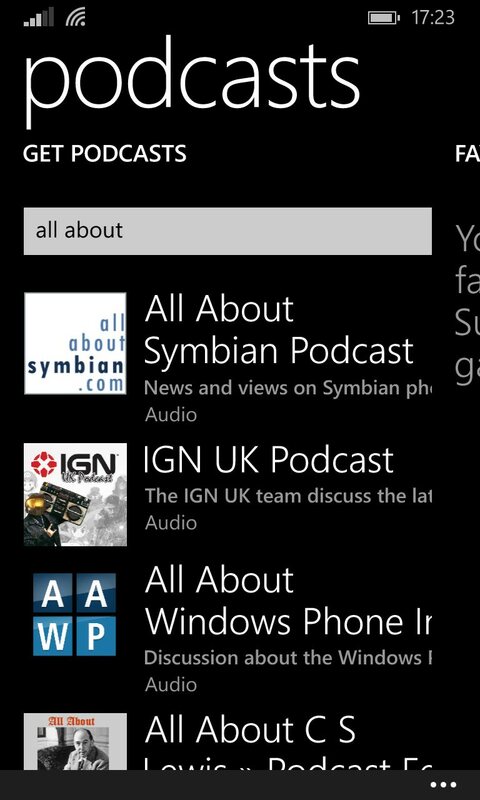 subscriptions), neatly laid out in a scrolling grid, 'collection', the same podcasts, but split between audio and video and laid out in list form, with summary of status, 'get podcasts', search access into Microsoft's directory, and 'now playing', whose function is obvious. 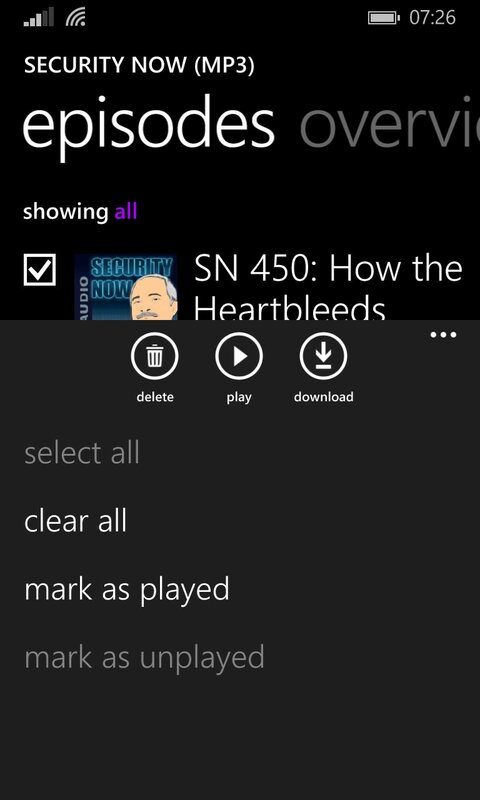 And that's about it - you can delve into a feed's episodes for selection and very basic management, or to view show notes, plus there's a very basic settings dialog, but Microsoft has deliberately kept the application as simple as possible. Tempting though it always is to recommend a 'built-in' solution rather than a third party one, if only because the recipient of your advice doesn't have to go and download and install something, there are a number of serious caveats here worth noting. The basics of podcatching work well enough - you find a podcast in the directory and tap on 'subscribe', and thereafter it's checked by Podcasts every few hours and the latest episodes are auto-downloaded as needed, along with notifications (building up in the new 8.1 drop-down pane, of course), while the playback screen offers scrubbing and multiple speed playback, along with nudge controls that also work on the pop-up Windows Phone volume controls, for when you're listening to a podcast in the background. What's not to love? The niggles start with acquiring your podcast set in the first place. There's no import function(e.g. from gPodder or an OPML file), so you (resignedly) set to work typing in search clues and finding podcasts from scratch. Which is annoying but hey, it's only a one time thing. 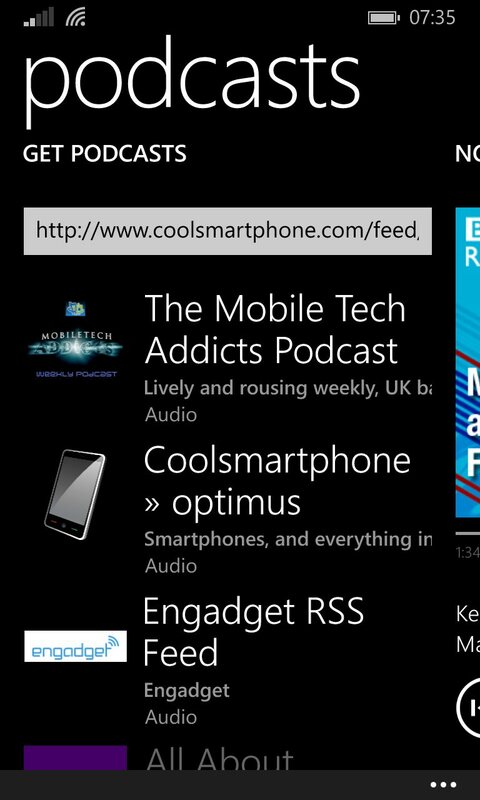 And then you realise that the directory used by Microsoft is out of date - seriously out of date, with many popular podcasts not present in the catalog at all and others represented by old RSS URLs which either don't work at all or present shows from 2012. Biting the bullet, you look up the correct RSS details for your favourite shows and try pasting them into the 'podcast name or URL' field, only to see that Podcasts merely searches for this URL in the old catalog, it doesn't accept 'new input'! Things starting to go wrong - oh dear, how on earth can PSC not be in the directory? (right) neither was Coolsmartphone, a UK favourite of mine, other than this stub entry shown here, with one solitary show from 2012. Err.... no thanks, Microsoft. So you plug in the right, full URL - and it just gets searched for and not acted upon. Gah. 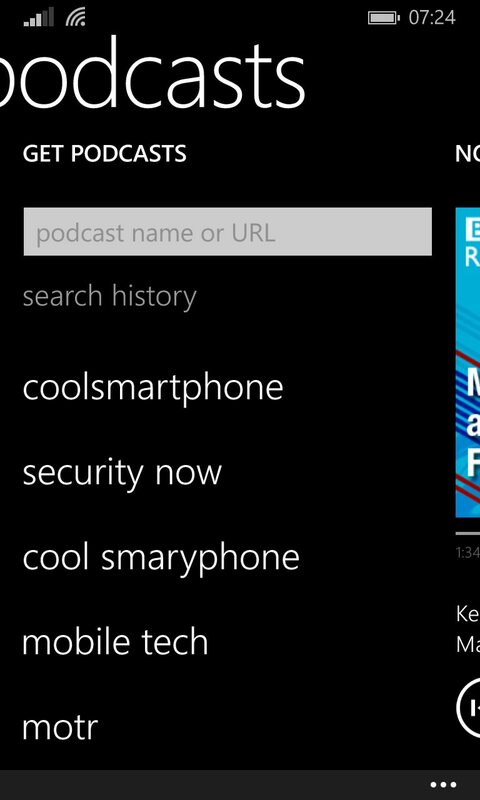 (right) At least the application keeps a basic search history, which is a nice touch. However, enough of your favourite podcasts are found, so you press on and soon have quite a few populating the attractively laid out grid of favourites. 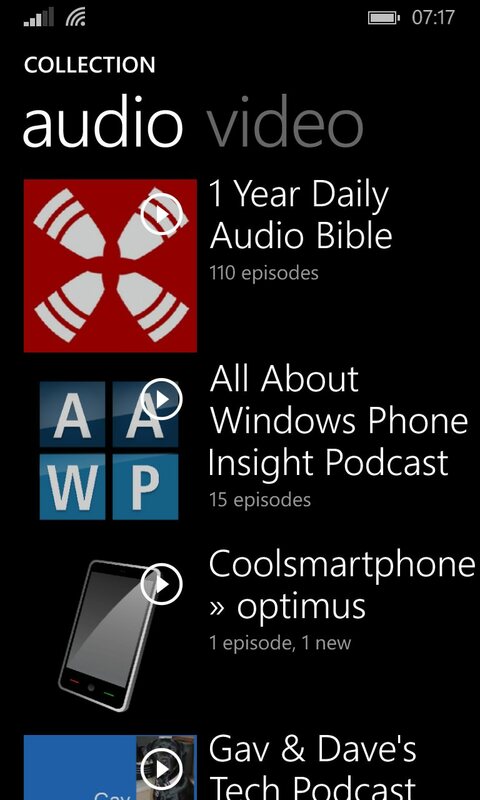 Swiping into the 'collection', each podcast is shown as the total number of episodes in the feed, plus the number that are 'new'. Unfortunately, the latter equals the former at first and the only way to reset these is to go into each feed manually, tap on 'select', then 'select all' on the menu, then 'mark as played', also on the menu. Rinse and repeat for every single podcast you've added. Which takes a while! Having done that, you can sit back and wait for new shows to be detected and downloaded - and, in time, the toast notifications come in. 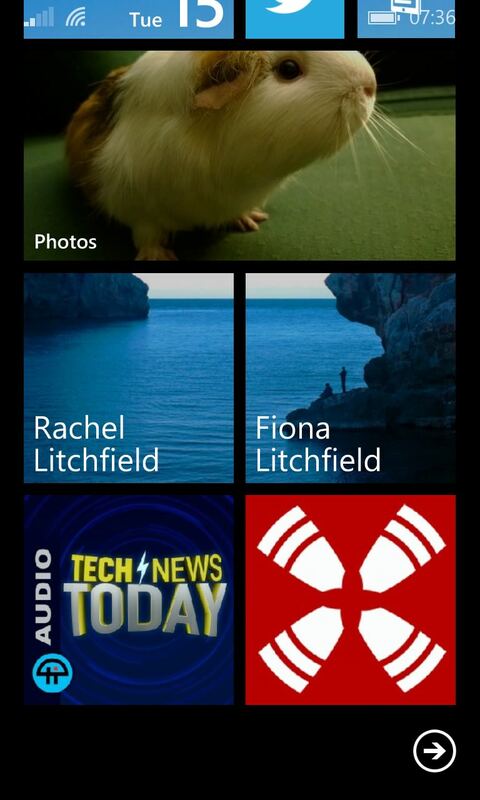 You open Podcasts and look at your favourites grid. No flags, no indications of exactly which ones have new content. You swipe across and tap into your audio collection and the list remains resolutely alphabetical, so you have to swipe down and down and then hope to spot '1 new' in very small font - there's no overall 'here's what's new and fresh' view. 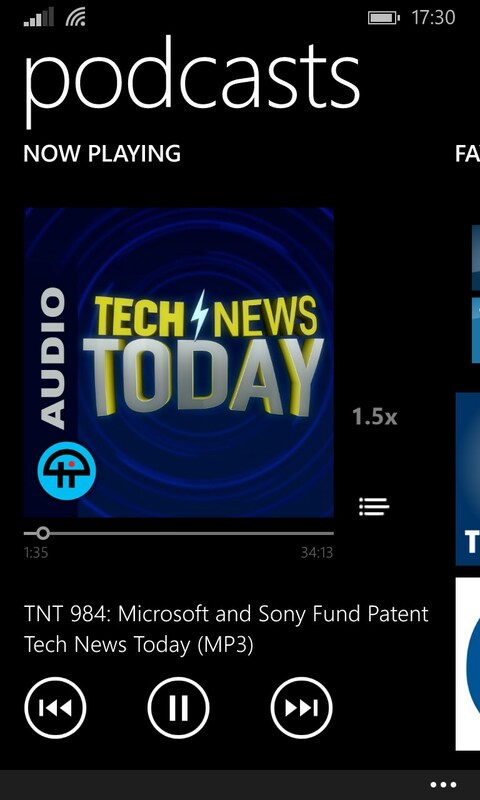 Along similar lines, there's the chance to pin individual podcasts as live tiles, but all you get is static artwork, with no animation or other indication to show that there's new episodic content available. I absolutely appreciate that I'm approaching Podcasts with the expectations of someone who has dozens of favourite shows, with an average of two new episodes per day across the whole set - in other words, a podcast power user. And, for me and, probably, for most others reading this, it's great to have lots of third party alternatives which are much more ambitious in scope. 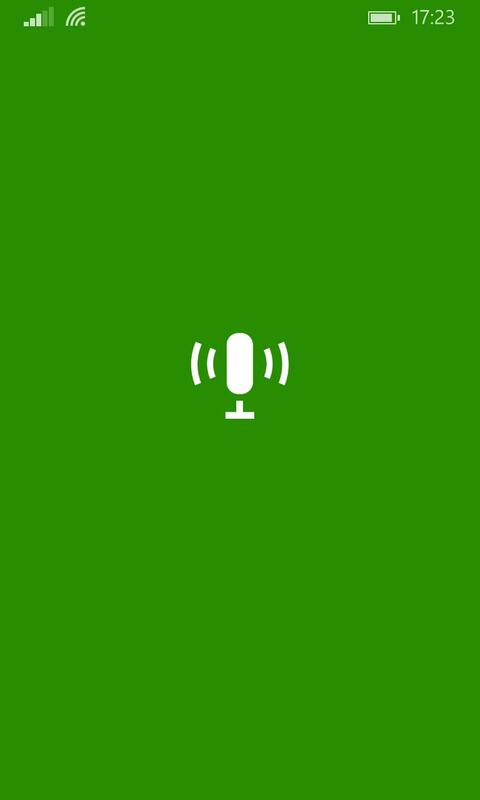 And so I applaud Microsoft for breaking out podcast functionality in a way that's accessible to podcast newbies - the application here gets most of the way towards Apple's built in podcast support in iOS7, for example. 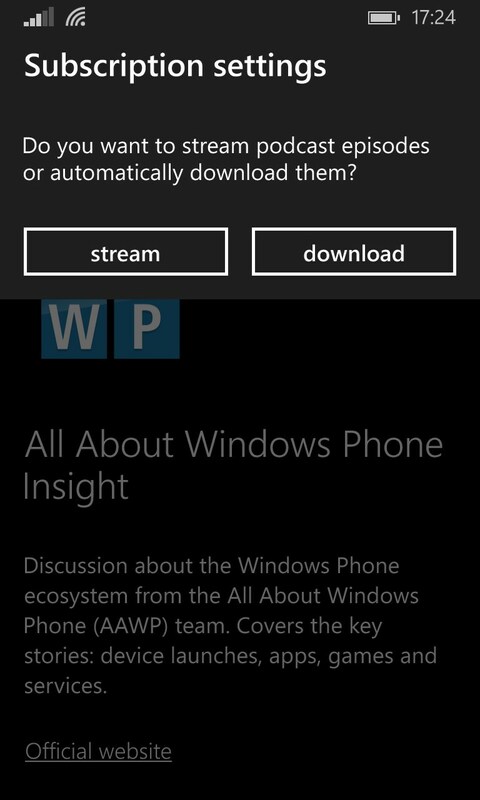 Just try it out (when available for your device, when WP 8.1 hits) before you go uninstalling your current third party favourite!